Item #0725: * 100% vegetarian, certified organic, and raw! 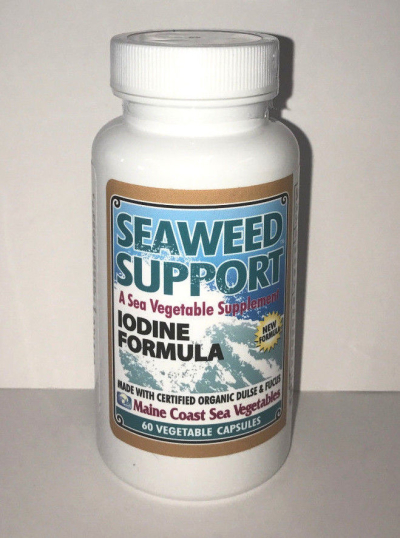 Seaweed Support IODINE Formula is a blend of North Atlantic medicinal botanical seaweeds in a convenient capsule form. This blend of sustainably harvested, certified organic Atlantic sea vegetables gives you a simple way to enjoy the health benefits of seaweed on a daily basis. Iodine is one of these benefits. 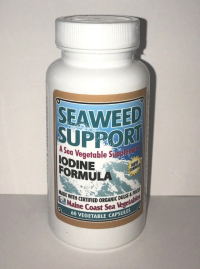 This new formulation provides a significant source of natural iodine. This encapsulated whole food is a proprietary formulation of five seaweeds: Organic Bladderwrack (Fucus vesiculosis), Organic Alaria (Alaria esculenta), Organic Rockweed (Ascophyllum nodosum), Organic Sea Lettuce (Ulva lactuca), Organic Dulse (Palmaria palmata). Our capsules are 100% vegetarian and certified organic!